Before the December holiday frenzy and festivities start, November is an ideal time to visit the southeast states to enjoy mild temperatures and unique festivals and events. Thanksgiving holiday weekend in the Southeast can also be a great opportunity to enjoy the beauty of the area and special events with friends and family. 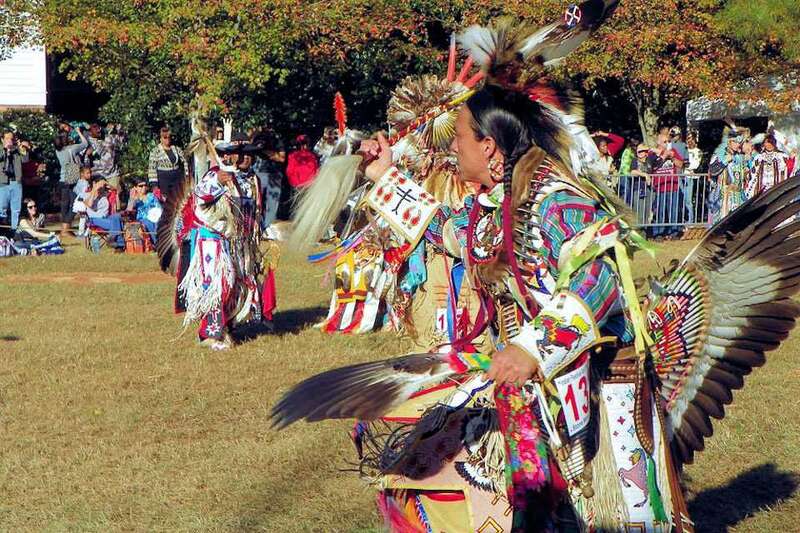 From a Native American gathering at Georgia's Stone Mountain to a South Carolina Pecan Festival, there are interesting cultural events and entertainment enjoyable for all ages throughout the southeast states. In early November, this four-day annual festival, the largest Native American gathering in Georgia, explores Native American culture through dance and drum competitions, craft demonstrations, cooking demos, music, storytelling activities, and more. The event was named a Top 20 event by the Southeast Tourism Society. The festival is included in Stone Mountain's all attractions Adventure Pass ticket which also includes access to the Geyser Towers, Summit Skyride, Scenic Railroad, Mini-Golf and more. Stone Mountain Park, a half-hour's drive from Atlanta, is Georgia’s most popular attraction and features a wide variety of activities located on 3,200 acres of natural beauty. There are hotels surrounding the park. It's oyster season in Virginia and the Urbanna Oyster Festival celebrates the bounty of the sea in early November. Designated as the official Oyster Festival of the Commonwealth, the festival attracts an estimated 80,000 people to enjoy food and craft booths, a great Fireman's Parade on Friday evening, a Saturday parade and more. Start your day at the Scottish Factor Store, part of the Urbanna Museum, and learn about the history of the oyster industry in Urbanna. Then head down “Community Row” to the Waterfront exhibits where you can see the industry in practice today. Visit the festival vendors and try all of the different ways to prepare and eat the local oysters (its a pay as you go system). Try wine and oyster pairings and sample Virginia craft beers. This annual community festival features family fun with entertainment, contests, food and crafts vendors, carnival activities, and yummy pecan pies. The Alabama Pecan Festival is held the first weekend of November on the grounds of W.C. Griggs Elementary School. The festival features live music, entertainment, carnival rides and games, craft vendors, food vendors, and the crowning of the Pecan Festival Queen. If you love pecan pies and want to learn about pecan farming, you'll enjoy this festival in beautiful, historic Mobile, Alabama. Touted as the largest one-day festival in southwest Georgia, this annual event, always held the first Saturday in November, features a sunrise breakfast, mule parade, flea market with hundreds of booths, a barbecue and fish fry, regional entertainment, and more. Calvary is a small town, population 200, but on Mule Day the population grows to between 30,000 and 60,000 (not counting mules). Mule Day celebrates the mules' significant contribution to the area's agriculture. Enjoy over 350 arts and crafts vendors, food concessions, cane grinding, and syrup making. Mules, from as far away as Tennessee, Mississippi, Alabama, and South Florida will be judged in the show arena. Head to downtown Florence for this popular annual community event held the first Saturday of November. With over 50,000 in attendance each year, it's a major event for the town. There are stages with live music, over 250 food and craft vendors, art demonstrations, a Free Kids Zone, amusement rides, antique tractor show, car show, and pecan cook-off with celebrity judges. Get your exercise with the 10 km, 5 km, and half-marathon races, a bike event and more. Veterans Day, a federal and state holiday in the United States, is always celebrated on November 11th. There are events throughout the Southeast, including parades and ceremonies on or close to Veterans Day. Birmingham is home to the longest-running Veteran's Day parade in the U.S. The holiday, first made official by President Dwight Eisenhower in 1954, has been celebrated with a parade in downtown Birmingham each year since. The Birmingham Veterans Day Facebook page is updated with details on the time and parade route. This annual four-day festival showcases independent films, including features, documentaries, experimental films, shorts, and animation, all at venues within walking distance from each other in historic downtown Wilmington. The Cucalorus Stage expands the festival’s programming with live performances. This is an ever-evolving creative festival. In 2018, The Lumbee Film Festival was launched. The festival is a partnership between the Lumbee Tribe of North Carolina, Cucalorus, and the NC Arts Council showcasing original new films made by American Indians, especially members of the Lumbee Tribe. Showcasing original artwork, this annual free fair takes place in Telfair Square in the heart of Savannah's historic district. Billed as Savannah’s largest, liveliest, and most celebrated open-air festival of visual art, Telfair Art Fair attracts thousands of high-end art collectors, tourists, local residents, and families. The event features 85 artists displaying and selling works in a variety of artistic mediums including painting, printmaking, digital media, sculpture, jewelry, ceramics, photography, furniture, glass, textiles/fiber, and mixed media. In addition to wonderful artwork, the event features an array of activities for children throughout the weekend. In 2018 the event takes place the weekend of November 10th. This annual festival features hand-made pottery and colonial crafts, pottery-making demonstrations, and an auction on the last day of the festival. Pottery collectors can pick up some limited edition pieces signed and dated by local potters. Always the weekend before Thanksgiving, the event starts on Friday with a gala auction and continues on Saturday and Sunday. Shopping begins when the doors open Friday night. Area pottery shops are also open. Always held on the Saturday after Thanksgiving, this annual event revolves around the preparation and consumption of chitterlings or chitlins. Chitterlings are a prepared dish usually made from the small intestines of a pig and widely available in the Southeast. The Chitlin' Strut attracts thousands of apparently hungry chitlins fans (some estimates say over 50,000), who consume over 10,000 pounds of chitlins. For a festive day trip, short getaway, or holiday vacation to the Southeast U.S., there are 50 fun seasonal attractions and fun places to visit, many that begin in November. Enjoy Christmas lights, visits with Santa, exploring time-honored traditions and more. In Helen, Georgia, enjoy a Bavarian Christmas theme. Nestled in the hills of northeast Georgia, the German-style city of Helen is known for its Bavarian buildings and nearby vineyards. Once Helen’s big Oktoberfest is over, visitors enjoy more than a month of Christmas activities. There's a traditional Christkindlmarkt and an annual downtown Christmas parade. Kick things off with The Lighting of the Village on the Friday after Thanksgiving, where you'll hear performances from local musical groups as Santa and Mrs. Claus light up the scenic town center.